bl.uk > Online Gallery Home	> Online exhibitions	> Asia, Pacific and Africa Collections	> Frere Hall [Karachi]. 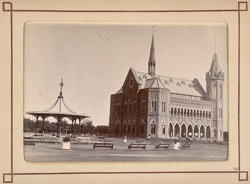 Photograph of Frere Hall (now Liaquat Hall) in Karachi, taken by an unknown photographer, c.1900, from an album of 46 prints titled 'Karachi Views'. Karachi, the former capital of Pakistan, is the largest city and main commercial centre of the country and the capital of Sindh province in the lower Indus valley. Its history prior to the 18th century as a port on the Arabian Sea north-west of the mouth of the Indus is scant, but it is believed to be ancient. It has been identified as Krokala, the port visited by Alexander's fleet in 326 BC, is noted in a collection of 16th century Turkish sailing directions, and was transformed from a fishing village to a trading post under the Kalhora and Talpur rulers of Sindh in the 18th century. However, it remained modestly sized until the British conquest of Sindh in 1843. They proceeded to develop the harbour of Karachi and transform it into a major port. Raised in memory of Sir Bartle Frere, Commissioner of Sind, 1851-1859, Frere Hall was designed by Colonel Clair Wilkins whose proposal was selected from 12 entries in the first recorded architectural design competition for a public building in Sindh. Built in 1865 using the local yellowish limestone, the cost of its construction was covered through public donations. The building was the hub of Karachi’s social activities and also served as a Town Hall with regular public meetings, concerts and theatrical performances. Gardens were added around it by Benjamin Flinch in 1887-88. The gardens are now called Bagh-e-Jinnah and the building which has been substantially redecorated in Islamic style by a Pakistani artist, now houses a library.